Companies these days are finding it tough to retain their employees. 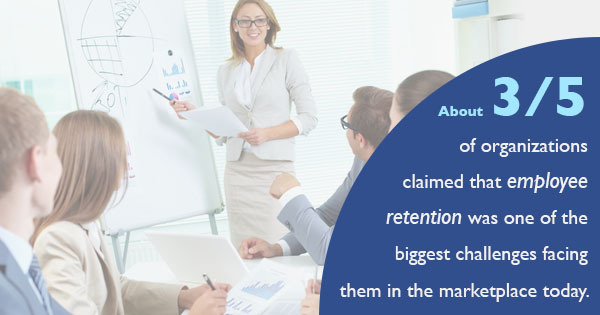 In a broad industry study conducted recently, 57% of organizations claimed that employee retention was one of the biggest challenges facing them in the marketplace today. While there's a huge number of reasons for this, it's hard to argue with the facts -- people leave their jobs. Sometimes, they leave early on in their stints of employment with an organization. It has been determined that around 22% of new hires will leave their jobs within 45 days of being hired. Reasons cited by the industry vary, though consensus has been reached that places poor performance and bad temperament squarely at the top of that list. What's even more shocking about all this is that this trend only shows signs of intensifying. In June 2015, 2.7 million workers left their jobs voluntarily. This is up about 25% from two years ago. What this essentially means is that there's a problem out there among employees, which employers aren't seeing. This leads them to feel the need to change their work environments, and causes a lot of folks to up and leave their positions in search of other work. This is one key area where outplacement consulting services can seriously help a business. Hiring new employees only to lose them a few months later is seriously costly, and can do businesses a tremendous amount of harm. This is why many companies opt to outsource much of the hiring process to an outplacement consulting service. Basically, these are organizations that specialize in providing the information, data, and strategies businesses need to make effective hiring choices that will bring them revenue, not necessarily the human capital businesses need. Outplacement companies work on very simple principles -- they carefully monitor trends in the employment marketplace and consult businesses on how to take better advantage of what is available. Sometimes known as talent acquisition firms or human resources consulting firms, these entities operate with the same goals in mind and will assist businesses in getting a better grasp over their hiring processes, and help those businesses gauge their expectations accordingly.